Here at Brickwork Southeast we provide many services including bricklaying, electrical work, plumbing and carpentry along with professional architectural services that include comprehensive architectural and design aspects for both commercial and residential building works. We believe in being environmentally friendly so offer designs with this in mind as well as providing tailor-made solutions to stay within our clients’ budgets. Our designers take great pride in understanding what clients require and adhere to their instructions throughout the design and building process, experts can create buildings that blend in with the background, look fantastic, unique and stand the test of time. Whatever your budget we can stay within it while not compromising on the quality of the finished project. Make contact soon to arrange an appointment where you can talk over your requirements with our team, fees include the drawing of plans which will be ready for approval and submission to the local authority for the necessary planning permission. Instead of using many different companies to design and build your new property it’s more convenient to use our professional building service so there’s no confusion of who is doing what, where and when. 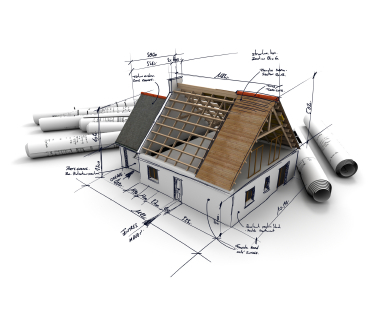 We come under this umbrella in that we have competent architectural designers, bricklayers, electricians, carpenters and joiners all under one roof who can work in tandem to make sure the final job is just what our clients have envisaged. Our team takes great pleasure in making suggestions too regarding how a build can look by providing innovative ideas and designs that you may never thought were possible so get in touch today.